In November 2016, about 3.4 million dehumidifiers were recalled by the GD Midea Air Conditioning Company of China. Midea manufacturers dehumidifiers under the following brand names: Airworks, Alen, Arctic King, Arcticaire, Beaumark, Comfort Star, ComfortAire, Continental Electric, Coolworks, Crosley, Daewoo, Danby, Danby Designer, Dayton, Degree, Diplomat, Edgestar, Excell, Fellini, Forest Air, Frigidaire, GE, Grunaire, Hanover, Homestyles, Honeywell, Hyundai, Ideal Air, Kenmore, Keystone, Kul, Midea, Nantucket, Ocean Breeze, Pelonis, Perfect Aire, Perfect Home, Polar Wind, Premiere, Professional Series, Royal Sovereign, Simplicity, SPT, Sunbeam, Sylvania, TGM, Touch Point, Trutemp, Uberhaus, Westpointe, Winix, and Winixl. Enter the product information from the back of your dehumidifier into this searchable database provided by Midea to see if it is included in the recall. 84 affected makes and models were recalled by the Gree Corporation in late 2013. 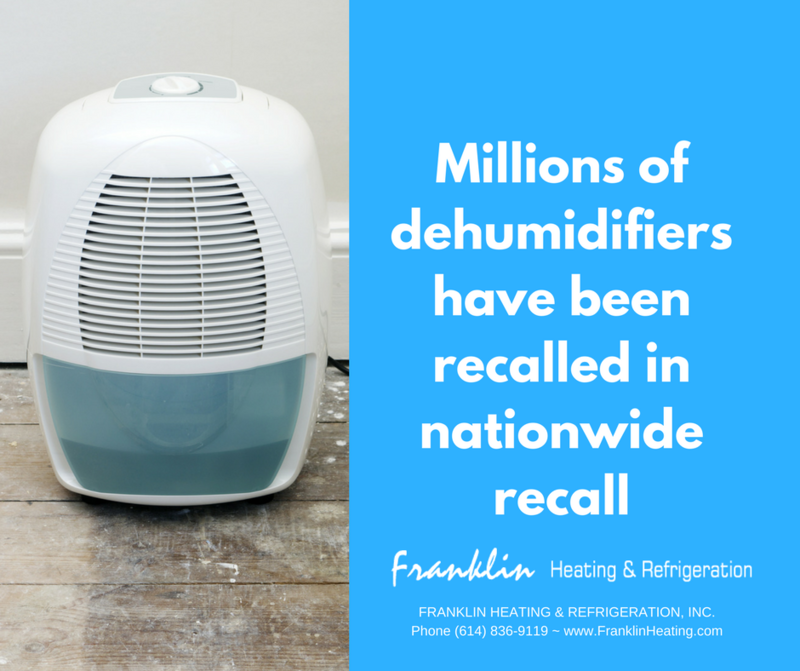 That recall involves dehumidifiers with brand names Danby, De'Longhi, Fedders, Fellini, Frigidaire, Gree, Kenmore, Norpole, Premiere, Seabreeze, SoleusAir and SuperClima. Once you confirm if your particular unit has been recalled, leave it unplugged until you know if it is safe. If you need a dehumidifier in your basement, Franklin Heating and Refrigeration has the solution. Give our office a call for a comparison of portable retail units versus Aprilaire whole-home units designed, assembled and tested in the U.S.
* WTHR Channel 13, Indianapolis (NBC affiliate); "Millions of dehumidifiers pose serious fire risk"
Special thanks to Aprilaire and WTHR for information shared here.